The birth of a new child is a glorious event! 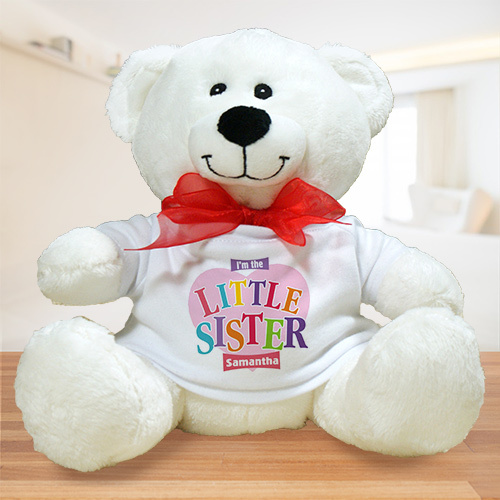 Celebrate this special time by giving this Personalized Heart Big Sister Teddy Bear to the new big sister. Choose from 3 colors, White, Pink or Blue Teddy Bears for your personalized Big Sister gifts. Personalize this adorable teddy bear with any name and please specify little, middle or big. Your Personalized Sister Teddy Bear is surface washable and safe for all ages. Teddy Bear is approximately 8" tall. Includes FREE Personalization. Choose from 2 colors, White or Pink, and add any name and please specify little, middle or big. The bear was really nice and soft.My granddaughter loved itand that it had she was a big sister and her name. This is just what I was looking for for my great grand daughter. She loves it. Browse our collection of big sister gifts to find a great way to get her prepared for a new member of the family!